“You fit in here,” the president told American Muslims in a rebuke to growing anti-Muslim bigotry. Wednesday afternoon, President Obama visited the Islamic Society of Baltimore—the very target of these threats—and offered wide-ranging remarks that sought to show the breadth of Muslim-American life and, at the same time, call for aid in beating back the threat of extremist terrorism. If one message stood out, however, it was Obama’s exhortation to young American Muslims—whose concerns about discrimination and harassment he had repeatedly cited—to be proud of their dual identities, that precisely this dynamic in their lives made them as American as apple pie. Obama’s remarks were a stunning—if overdue—rebuke to the dark forces that have plagued our national discourse, giving rise to increasingly mainstream bigotry. He chided the “inexcusable political rhetoric against Muslim Americans that has no place in our country”—a clear shot at virtually the entire Republican presidential field, which has embraced anti-Muslim hatred either as a matter of ideology or political utility. He took on the “distorted media portrayals in TV or film,” something Muslims and those of Muslim extraction grouse about frequently but rarely hear aired in major fora, let alone in a presidential speech. Neither did Obama mention Washington’s continued Forever War, a borderless military undertaking that seems, nonetheless, to affect only Muslim countries. Obama mentioned, briefly, the hashtag campaign joined by many military service members and veterans pledging to protect 8-year-old Sofia Yassini, a Muslim-American child who became afraid that sometime GOP presidential frontrunner Donald Trump’s Islamophobic policy proposals threatened her safety. “Think of our men and women in uniform,” Obama said Wednesday, in a show of Muslim Americans’ place in our national society, “who, when they heard that a little girl was afraid because she’s a Muslim, sent her a message—’I Will Protect You.’” The tale is a heartwarming anecdote, but it will be of little comfort to the 21 Muslim children in Yemen who reportedly perished in a drone strike launched by US service members acting on Obama’s orders. Those Muslim children—and countless and uncounted more like them—weren’t even lucky enough to have the Obama administration explain the circumstances of their deaths; unlike the two non-Muslim Westerners accidentally killed in a drone strike, most civilian deaths in American targeted killings abroad—the vast majority of them Muslims—go unaccounted for by the Obama administration. Despite Obama’s remarks, his administration refused to condemn the NYPD’s spying on Muslim-American communities. And yet, despite these issues, the speech must be viewed as a small victory for justice amid the growing crisis of anti-Muslim invective in American politics. Indeed, Obama’s visit to the Islamic Society of Baltimore was attacked by all the usual purveyors of Islamophobia on the right—the same pundits and activists who have spurred the mainstream of the Republican Party to embrace its hateful present-day positions. Obama has made small outreaches to the Muslim-American community over the years—most recently as a rebuke to bigotry with his invitation to Ahmed Mohamed, the young inventor who was perp-walked from his school on suspicion of building a bomb that was really just a clock—but had yet to visit an American mosque as a sitting president. With his visit to Baltimore, Obama became just the third president to make such a gesture, following in the footsteps of Dwight Eisenhower and George W. Bush. “We are one American family,” Obama said toward the end of his remarks. “We will rise and fall together. It won’t always be easy. There will be times where our worst impulses are given voice. But I believe that ultimately, our best voices will win out. And that gives me confidence and faith in the future.” His speech and his choice of venue gave heft to those sentiments. But “belief” and “faith in the future” aren’t nearly enough. 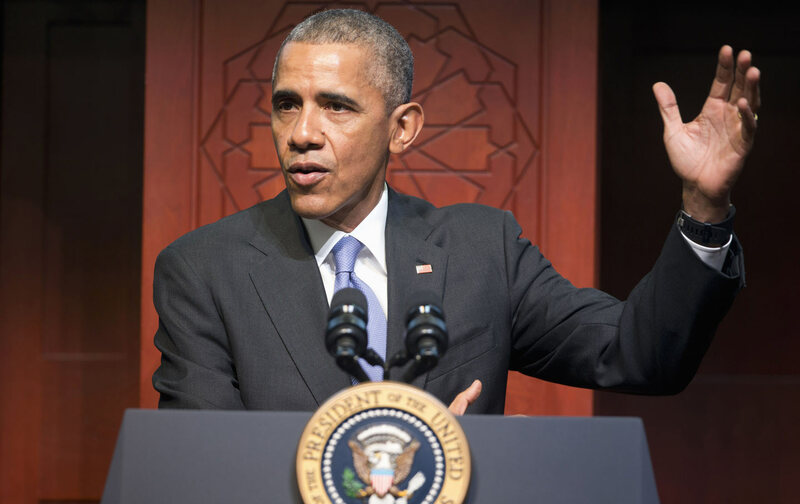 “There is a battle of hearts and minds that takes place—that is taking place right now, and American Muslims are better positioned than anybody to show that it is possible to be faithful to Islam and to be part of a pluralistic society,” Obama said in Baltimore, referring to the “burden” of peace-loving Muslims, who continually have to demonstrate their good intentions amid the scourge of extremist terrorism. That statement might as well apply to the battle for the hearts and minds of those Americans in thrall to anti-Muslim ideologies, but it will take more than just American Muslims’ example to sway them, and it will take more than just the leadership on display in a single presidential speech. Ali GharibTwitterAli Gharib is a contributor to The Nation.